Integral footplate – provides secure fast mounting. Spigot designed for speedy installation of flexible ducting. 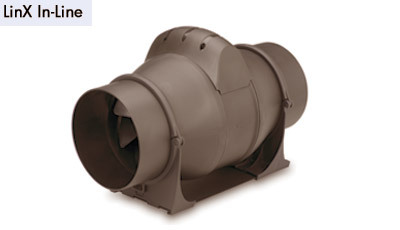 A range of 8 in-line mixed flow fans designed for use with flexible or rigid ducting. Mixed flow fans develop greater pressure than conventional axial fans making them ideal for use in ducted systems. The LinX range consists of 4 sizes, 100, 125, 150 and 200 mm with air volumes from 190m³/h to 910m³/h in free air. The compact size makes them ideal for use in restricted spaces such as ceiling voids traditionally found in refurbishment.